A train can travel anywhere between 10 mph and 220 mph, depending on the type of track it is on. Based on the rate of death per collision, a motorist is almost 20 times more likely to die in a crash involving a train than in a collision involving another motor vehicle. In 2015, the Federal Railroad Administration reported that 2,059 railroad crossing accidents occurred throughout the US. A reported 150 pedestrians were seriously injured in 2015 as a result of a railroad crossing accident. In Washington, there were 37 railroad crossing collisions in 2015. Look. Just as you would when crossing the street, before you cross the tracks you need to ensure that there are no trains in sight by looking both ways. Listen. In some cases, safety signals and barriers may not be present or working. In addition, many crossings are situated near curves that make it hard to see an oncoming train. Therefore, when you come near a railroad crossing, make sure to listen for any signs that a train may be approaching. Stop. If there’s any indication that a train may be headed toward you, immediately brake. Although you may think you have time to scoot across the tracks before the train gets to you, it isn’t worth the risk. In other words, trains are faster than they look, so do not try to outrun them or the descending barriers. Call. In the event of a collision, you need to know where you can turn to get the advice and guidance you need to secure medical compensation. Unfortunately, few of us have the time or resources to scan a list of attorneys and pick one from the scene of the accident. So, protect your future by putting an experienced injury lawyer’s contact number in your phone right now. The name is Andrew Kim and the number is (425) 289-1990. Hopefully, you will never have to use this information…but if you do, you will be prepared. 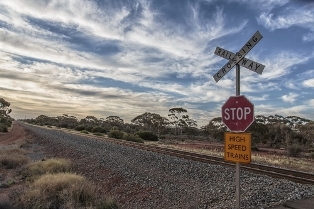 Post a Comment to "How to Avoid a Crash At a Railway Crossing"